Today, I’ve decided to feature a song I don’t know how I found, by an artist whose name I apparently don’t know how to spell. It’s official. I’m losing my mind. It’s the real thing and I just have to accept it. Why do I say this, you ask? (And if you don’t…ouch.) Naturally, any good day starts with an unintentional search for a new song, and ends with the comfort of knowing that I found one. Going by that theory, today started about an hour ago. I didn’t have a chance to listen to music until then. While I don’t always describe the extent of my musical searches for HauteThought, I generally know how I made my musical discovery. Today, I was blind sided. There’s something you should know about me. I tend to make a lot of…lists. And I like to write them on…post-its. Lists for the grocery store, lists of movies to watch, lists of things to do, lists of random things to remember. You name it, I’ve written it. Let’s revisit the “lists of random things to remember,” shall we? I stumbled across one of my many post-it lists today and discovered that I had a list blackout. I do not remember writing all of these things down, but I know for a fact I wrote one of these things yesterday. If all things were written yesterday, I truly am losing my mind. But honestly. Look at that jumbled list of things! I do recognize 5/7 items. Unfortunately, today’s artist for song of the day isn’t one of them. Even more embarrassing…I spelled his name wrong. (Something else you should know: I hate grammatical errors and spelling blunders.) Please please please forgive me, Jamie. I meant nothing by it. I know your name isn’t Lamie. There is nothing lame about you! With all of that said…once again, today, I’ve decided to feature a song I don’t know how I found, by an artist whose name I apparently don’t know how to spell. However, I’m thankful for this musical blackout. It took me to a great artist and absolutely adorable video. I’ve found the real thing with UK artist Jamie Lawson, and I have a feeling this is the beginning of a soon to be wonderful relationship. 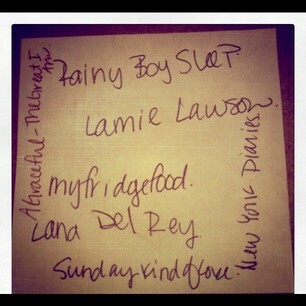 Tags: HauteThought, Jamie Lawson, Music, post it, Real Thing, Song of the Day. Bookmark the permalink.